FREE Scotch Package Opener w/ Coupon! Check out your Walmart's Holiday Clearance section and look for Scotch Package Openers. 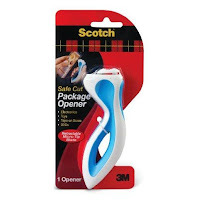 People are finding them priced at just $1.00, making them FREE with this new $1/1 Scotch Safe Cut Package Opener coupon! You can find the coupon under zip code 30303 in the Storage & Packing tab. You may have to watch a short video first before you can print it out.